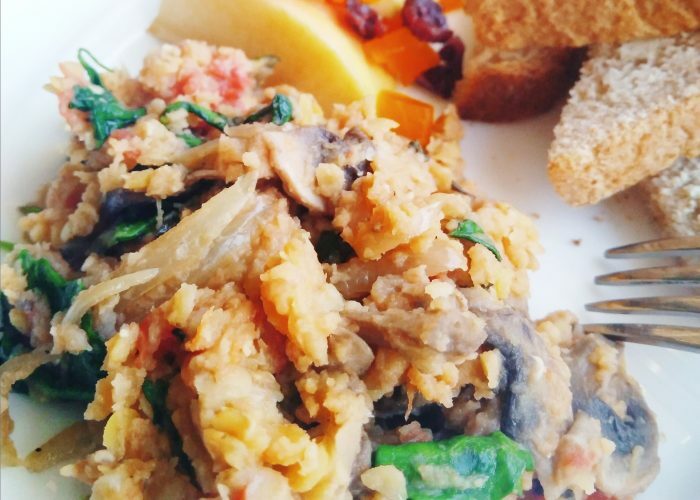 Here is a simple hearty vegan, egg-free, dairy-free, gluten-free breakfast recipe you can serve your family or guests. Despite the name of this recipe, you can also eat this delicious dish at any other meal of the day! It goes well as a side or main dish on the family table and can be paired with bread, couscous, rice, pasta, baked potatoes, orzo, grains, quinoa or other gluten-free alternative. If you don’t want to add spinach (or kale) to this dish, you don’t have to, as this dish will still taste delicious without any leafy greens. This recipe works great with leftover cooked lentils sitting in the fridge, or you can prep ahead by cooking up some lentils the day before, to save time on the day of cooking. Feel free to scale up the recipe depending on the number you have at the family table. A delightful nutritious, vegan, egg-free, dairy-free, gluten-free dish that can be enjoyed at breakfast or any other time of the day! Cook the red lentils (If you already have leftover cooked lentils prepared, skip to step 2) following the directions here. Meanwhile, heat up the half tablespoon of oil in a saucepan or skillet on medium heat. Once the oil is hot, sauté the onions in the oil for a minute, then add the mushrooms and cook for about 5 minutes or until caramelized. When the lentils are cooked, take out one cup’s worth and add the seasonings (cumin, garlic powder, salt and pepper) to this drained amount. Stir to mix in the seasonings. Using a wooden spatula, move the chopped mushrooms and onions mixture to the side of the saucepan and pour the remaining half tablespoon of oil on the empty side of the saucepan. Add the minced garlic and sauté for about 1-2 minutes or until the garlic turns golden. Add the chopped tomatoes and the dried or fresh basil to the garlic and stir quickly, cooking for 1-2 minutes until the tomato pieces soften. Add the seasoned cooked lentils to the tomato mixture, and stir to combine. Cook for another 2-3 minutes to heat up the lentils. Combine the lentil tomato mixture with the mushrooms and onions. Stir all together. Once heated through, add the chopped spinach leaves (optional). Stir and cook for another 2 minutes until the spinach leaves are just wilted. Taste and adjust seasonings (you may add a bit more salt and pepper if you desire!). Serve warm. such a wonderful recipe and website!